Irishman Cameron Hanley (IRL) pulled out all the stops to take a blistering speed class win during this afternoon’s Prix Hotel Martinez. As the sun began its slow descent over Cannes, Hanley and top mare Eis Isaura shot to the top of the leaderboard after a powerful performance, finishing a second and half ahead of Frenchman Olivier Robert (FRA) and Jane Richard Philips (SUI) in third. A happy Hanley spoke after his round: “With Bosty last to go it’s always a big threat! [Eis Isaura] is a very talented mare, and really scopey, so I was able to shape the turns and I knew she wouldn’t hit the rails. When you come to these shows to win anything is fantastic, but the next class is coming so we’ll try to do the double." 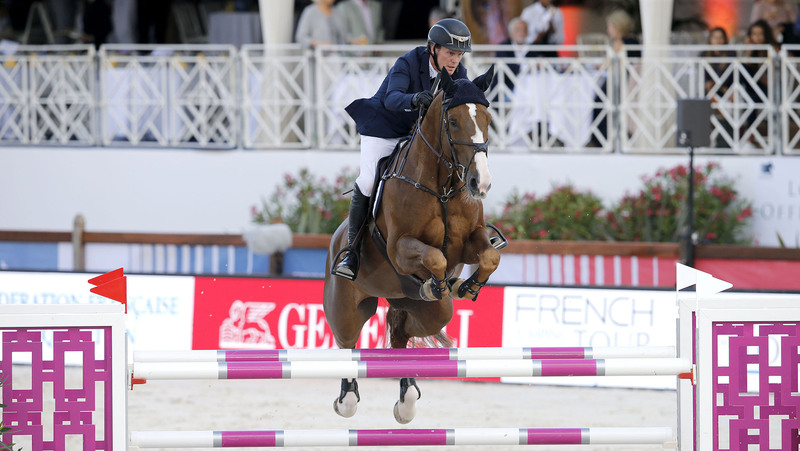 The 1.45m speed class saw 31 of the world’s top riders take to the Uliano Vezzani designed course. Denis Lynch (IRL) was the first to go clear, stopping the clock in 65.45s with Fairview Aliquidam but leaving the door open for the field to come. Quick to follow, Jane Richard Philips (SUI) soon shaved two seconds off, the Longines Ambassador of Elegance powering to the lead with Izmir van de Baeyenne to set the new time to beat at 63.81s. While this was a speed class, many of the world’s best took the opportunity to gain experience on their younger horses, with Scott Brash (GBR) and Hello Jefferson putting in a steady schooling round. Maikel van der Vleuten (NED) took the same tact with Idi Utopia, picking up four time faults but pulling out a steady clear, as did Ben Maher (GBR) with LGCT Grand Prix Madrid winning horse Explosion W.
Local fans were delighted as Olivier Robert (FRA) with Cache v. flew around the small sand arena, pushing to finish a full second faster than Philips and stop the clock in 62.91s as the crowd roared their approval. Clears followed from Rolf-Göran Bengtsson (SWE) with Crunch 3, Alexandra Paillot (FRA) with Tonio la Goutelle and Anna Kellnerova (CZE) with Balguero, René Lopez (COL) with Cevrine du Banney Z, but it was a long time before anyone could come close to Robert’s time. But Cameron Hanley (IRL) pulled out all the stops with Eis Isaura, shaving all the corners but taking a holding five strides to the last but finishing over a second quicker than Robert to take over the lead in 61.18s. Edwina Tops-Alexander (AUS) put in a storming round with Veronese Teamjoy, looking up on time during the early part of the course. The duo looked set to challenge Hanley’s time, until the final Air France fence fell, knocking them out of contention. Final rider to go Roger-Yves Bost (FRA) was over a second faster than Hanley midway through the time, galloping to the fences with Tesway de la Batia. But the oxer tumbled, leaving Hanley’s time standing and the Irishman the leader of the pack heading into tonight’s competition.